Gruss Gott! (That's a little greeting I learned in Germany.) As soon as I got confident throwing "Guten Tags" and "Guten Morgens" around in northern Germany, we headed south where the common greeting changed to "Gruss Gott," which translates to "God greet (you)." Then to really throw me off my game, we spent a couple of days in France. Oh, how I wish I took French classes in high school! Anyway, I have lots of pictures from all the beautiful places we visited. I'm busying editing them, and I'll share them in a series of posts as soon as I can. But, for now, I want to share a finished project that is loooooong overdue. 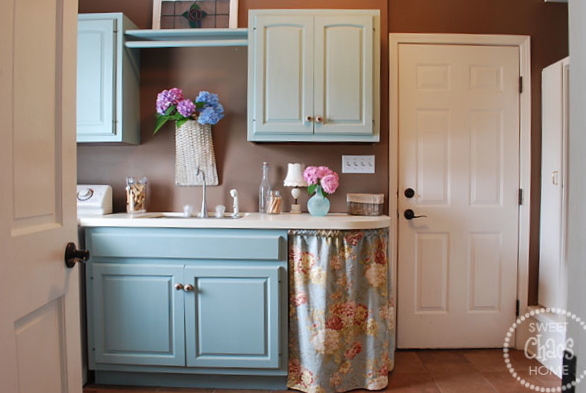 See that fabric skirt under the countertop? Well, it's been almost 2 years in the making. I knew I wanted a skirt to conceal the big ole container of dog food, so I bought some fabric. And, that's as far as I got for a really long time. Two things stood in my way. One... I can't sew. Two... 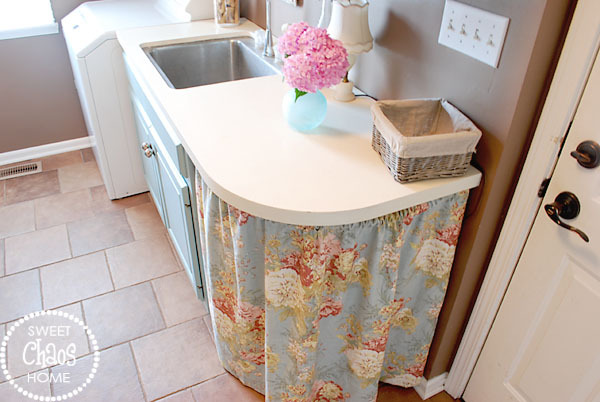 I couldn't figure out how to hang the skirt around the curved countertop. After a couple of trips to the hardware store, I devised a plan to hang the skirt. These were the materials I used. I'm sure you engineering/DIY types could have developed a more sophisticated method, but this is the best my brain could come up with. 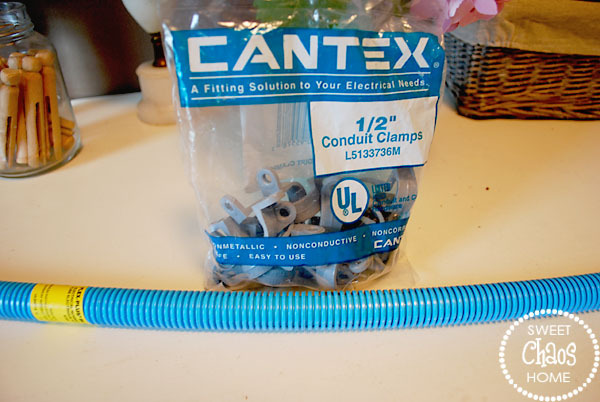 I screwed the conduit clamps onto the underside of the countertop and put the flex pipe in the clamp on either end. My sweet friend, Nadine, sewed the skirt for me, and we just threaded the pipe through the top tab. 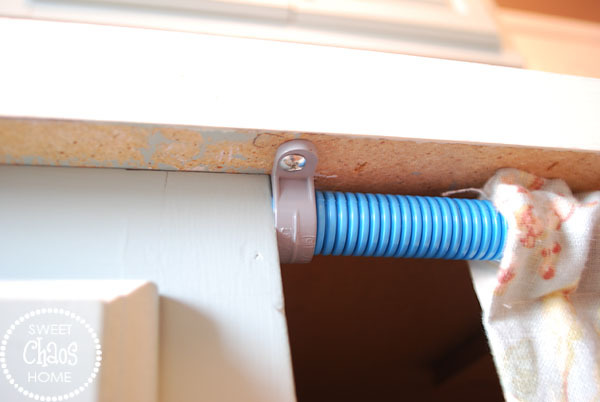 The trickiest part was keeping the pipe from sagging down around the outside curve of the countertop. A small eye hook and some fishing line solved the problem. When I bought the fabric, I predicted it would take me 6 months to get the skirt done. Well, I was only off by 15 months. Speedy Gonzales, I. AM. NOT. Good call on using the conduit stuff! Oh how cute and clever there! Love the fabric you chose too. Happy 4th to you and your family. I absolutely love your new beautiful skirt! Such an awesome way to hide things! Happy 4th ... look forward to seeing you at Haven! that is awesome! what a perfect solution to hanging it and it looks gorgeous, too! I love the skirt! It looks so cute! I just made some roman shades out of that same fabric, it's beautiful fabric! Stop by and check out my shades if you get the chance. That looks awesome! 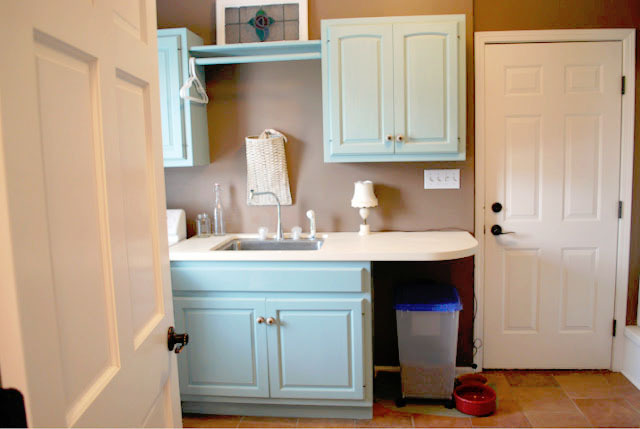 A little ingenuity is all it took...and lots of months ;) What are your wall and cabinet paint colors in there? So gorgeous! 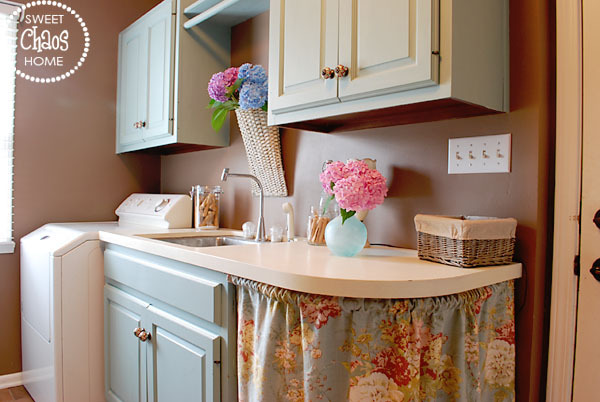 Love, love the skirt and what a great idea to hang the skirt!...The laundry room looks so beautiful!